Arguably, I am the most photographed—and the most stunning—Victorian home in Galveston, Texas’ East End historic district. Why? 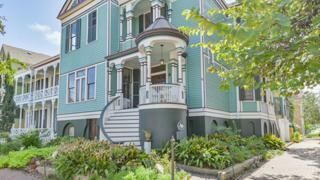 Locals and tourists will point to my curved porch entrance and robin-egg blue exterior as my standout features. But I’m more than meets the street-level eye. Take a closer look, and you might realize I am your next home. My first owner, Maud J. H. Moller, was as prominent in 1890s Galveston as I am today. She bought the property from her father, and I was built either in 1894 or '95. Maud and her Danish immigrant husband, Jens, were well-known in the city’s public and private life; for 20 years, Jens was consul to Denmark and Russia. They rented me out in 1898 to Ulrich Muller, a successful cotton broker, who lived here for over a decade. When it comes it Galveston society, I’ve seen it all: I was a boarding house for years, and my porch was the site of the 1936 murder of a resident connected with notorious Galveston gangster Johnny Jack Nounes. Like I said before, I’m more than my exterior. Today, I’m a 2,700-square-foot beauty with three bedrooms and two bathrooms, a basement, an attic, and an outdoor brick courtyard. Don’t sweat the idea of living in a historic home in Texas, either: I’ve been updated with modern central air and heating. My high ceilings beckon light in, and many rooms lead to exterior porches. I even have my original entryway chandelier. 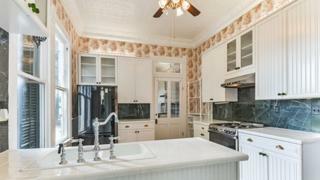 My kitchen has been modernized, but it retains the Queen Anne touches that makes me so special. 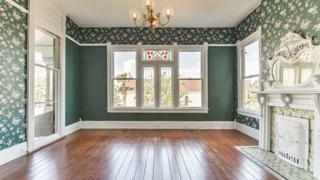 If you’re ready to be the next prominent Galvestonian to live at the corner of 19th and Ball, see my listing here. Kathy and Tom Bass bought me in the 1990s and gave my kitchen a Victorian look. Many of my rooms lead to porches that overlook 19th and Ball. Emma Sarappo is an Editorial Intern at the National Trust. She can be found writing or in the kitchen of her century-old DC rowhouse.